endemia.nc - Amanita sp 1. Pileus: broadly convex becoming applanate; 40 -50 mm diameter; glabrous, grey; velar remnants flat, white, fugacious; margin not appendiculate. Stipe: clavate, expanding downwards to a bulbous base; 70 × 10 - 15 mm; glabrous; greyish white; ring pendulous 60% up, white. Gills: adnexed; white; lamellulae intercalated in two series. 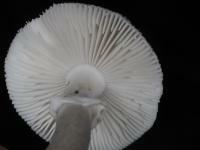 Notes: a medium sized grey Amanita, with a clavate stipe and white ring.